What’s your favorite part about attending a wedding? If you say something like the ceremony, the first dance or cutting the cake, you’re fibbing. It’s the open bar. So make your Royal Wedding party awesome with an open par with a signature drinks and DIY idea. I’ve been intrigued by Pimm’s for a few year’s now, but I have yet to put my lips on one of these bad boys. 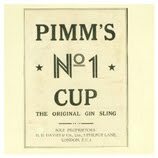 According to my trusty friend Wikipedia, Pimm’s was created in 1823 by James Pimm, a partner and owner of an oyster bar in London. The original tonic was a gin-based drink with a secret mixture of herbs. It was originally created to aid digestion and served in a small tankard known as a “No. 1 Cup.” This is where the name Pimm’s No. 1 was born. James Pimm set up a distillery for mass production and over the years more “cups” were made (i.e. No. 2, No.3). After some hard financial times, Pimm’s No. 2-5 were phased out in the 1970’s, but then in 2006, the brand was bought by big spirits company Diageo. 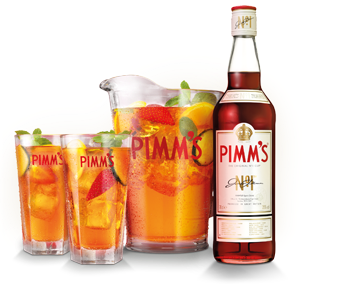 Today, Pimm’s is a staple drink at Wimbledon and the Henley Royal Regatta. • Take a jug or long drink glass and fill it with ice. • Mix 1 part PIMM'S No.1 with 3 parts chilled lemonade. I once saw an idea for a DIY Pimm’s bar, but I can’t seem to find the site that I book marked. Regardless, I found out some tips to pull this off via a site called Serve Draw. So here’s how you make this an interactive party buffet. • Get some other alcoholic mixers like Gin, Whiskey, Limoncello, Applejack, St. Germain, Champagne – a splash of these can give your Pimm’s cup a different taste that can please everyone’s pallets.